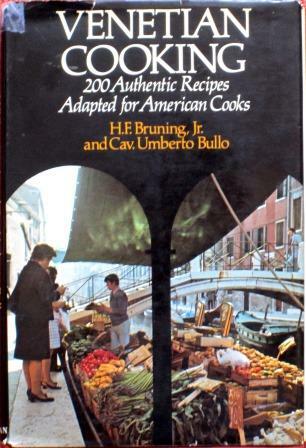 Looking through that book recently, I was struck by the way cut-up chicken is both sauteed and baked in a recipe called Poulet sauté à brun, croustillant, a.k.a. 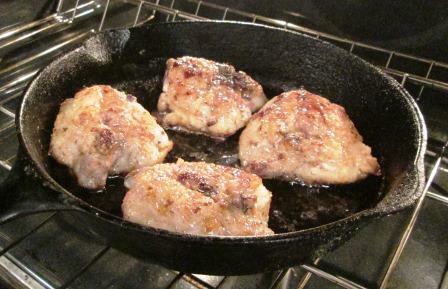 Crisp Brown Sauteed Chicken. 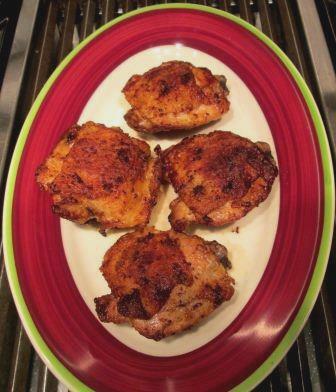 Julia calls it the French answer to American fried chicken: crisp and brown on the outside, moist and tender inside. Sounded like a winning combination. Also interesting was an assurance that, at two points during the cooking, the pan could be taken off the heat for several hours and continued later. That seemed potentially very useful on a busy day, so I tried doing it that way, even though I didn’t need the pauses then. 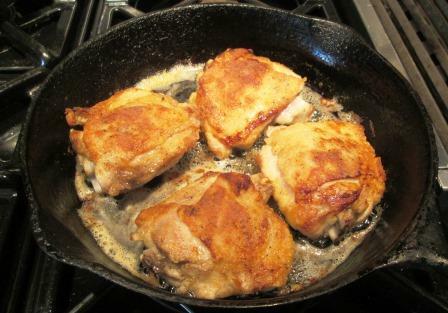 In the late morning I dipped four chicken thighs in milk, salted and peppered them, and shook flour over them to coat. I put the pieces to brown in butter and oil, skin side down at first, in a cast-iron pan that I’d eventually bake them in. After about 10 minutes, both sides were nicely browned. I moved them to the back of the stove and left them there. In midafternoon I continued with the recipe. This stage didn’t take long. I heated the chicken on the stove until it was sizzling, basted the pieces with the cooking fat, turned them skin side down again, and transferred the pan to a 375° oven. Five minutes later I turned the pieces, basted them again, and baked for another five minutes. Then off the heat again and onto the back of the stove. The thighs hadn’t changed much but still looked good. As dinner time approached I repeated the stove-top reheating and the two five-minute bake-and-bastes. I transferred the thighs, now even a richer brown, to a platter and kept them warm in the turned-off oven while Tom made a little pan gravy (I was tending the dinner vegetables). 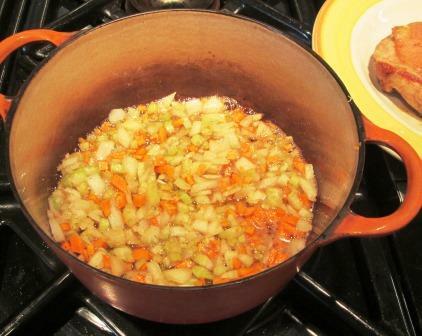 The gravy, which the recipe calls a brown deglazing sauce, involved chopped shallots, white wine, broth, and a bit of crème fraiche that we had left in the refrigerator. It went very well with the chicken, which was indeed crisp and brown on the outside, moist and tender inside. Not harmed at all by its off-heat rest periods. And very, very tasty – even my non-chicken-loving spouse had to agree! During the holiday season just past, I served two excellent French-style dinner-party appetizers that I look forward to making again in the coming year. As an aid to memory, I thought I’d start my 2019 blog with an appreciation of the two dishes. One, asparagus croûtes, was quick, easy, and even tastier than I’d thought it would be from reading the recipe. The other, salade de geziers, was also quick and easy in the assembly and thoroughly delicious in the eating, but the chief component has to be prepared far in advance. This is a plain looking dish, but its simple flavors come together in one of those magical French ways that make the whole greater than the sum of its parts. (Hint: Think butter.) The recipe comes from esteemed chef Raymond Oliver’s La Cuisine, which gives it a distinguished culinary pedigree. For each serving you need one slice of homemade-style white bread, crust cut off and the slice cut in half; and enough spears of asparagus – thick or thin, as you prefer – to top the bread completely. In my version, on each half slice I used the tip ends of four thinnish spears, cut in lengths the size of the bread. The asparagus gets cooked in boiling salted water until just tender, then sauteed gently in butter for two minutes. The bread is fried in butter and olive oil until golden. 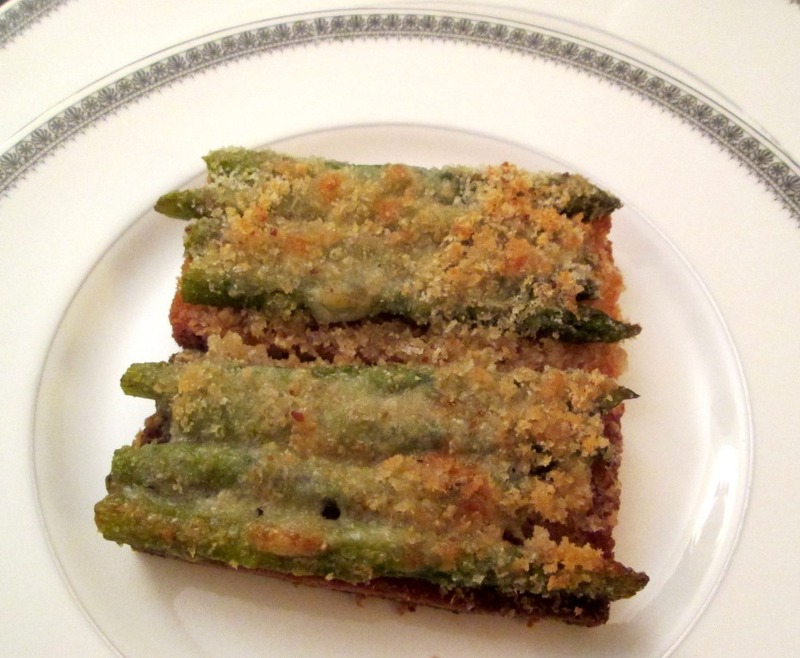 In a baking dish you place the bread slices, arrange the asparagus on them, and sprinkle generously with grated Swiss cheese and fine dry breadcrumbs. Then, you either run the dish under a broiler or else bake it in a 450° oven until the croûtes are golden and bubbly. Doesn’t look like a lot on the plate, but it’s quite filling. Of course, if you’re feeding very hearty eaters, you can always increase the number of croûtes per person. 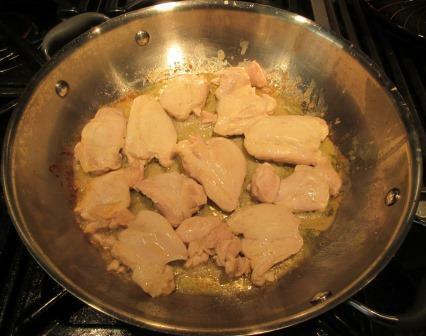 Geziers are gizzards, an ingredient many Americans consign to cat food – a big mistake. Gizzards can be delicious. 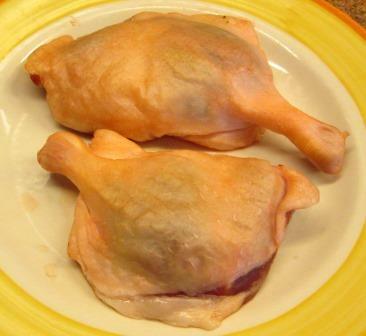 While one of them should be included in every bag of giblets tucked inside a purchased chicken, it takes a long time to collect and freeze enough gizzards to do anything significant with, so I buy them separately. And what I do is confit them. Making confit is a time-consuming process, but once it’s done you have the wherewithal for this splendid salad. 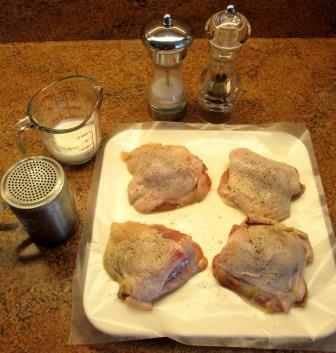 Essentially, to confit gizzards you toss them with salt and refrigerate them for a day. Scrape off the salt, put the gizzards in a heavy casserole with melted duck fat to cover, bring it to a simmer, and cook covered in a very low oven for several hours, until they are tender. 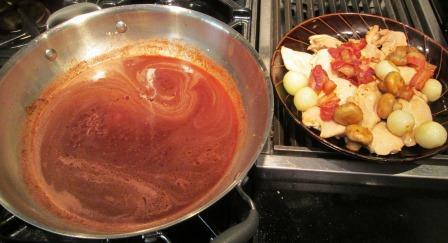 Drain, cool, and transfer them to a large jar; and pour over enough of the cooled cooking fat to cover them completely. They keep in the refrigerator for months. For the salad, you want a leafy green that’s at least a little bitter, to contrast with the unctuous gizzards. 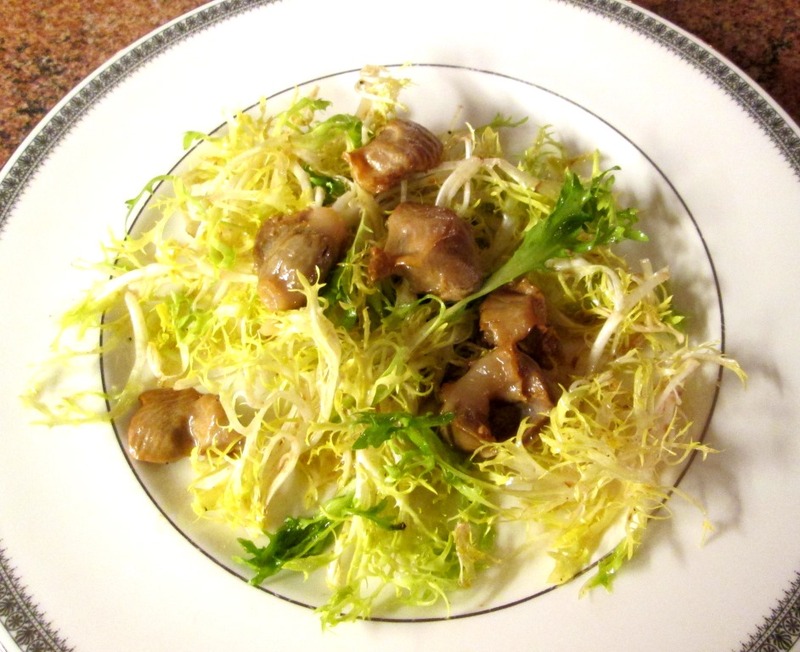 Frisée is my first choice, but if it’s not available, tender leaves from the heart of escarole do very well. 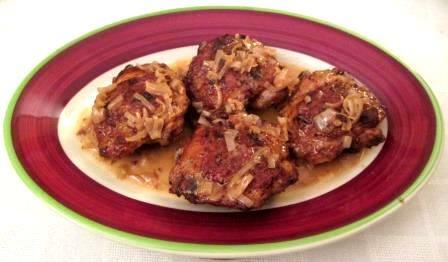 I dress them with a vinaigrette made with walnut oil and my homemade red wine vinegar, then top them with warmed gizzards. It’s an intriguing combination on the palate: crisp and soft, sharp and mellow, bracing and soothing. Both these dishes are truly – literally – appetizers. That is, they stimulate your appetite for what will be coming next. Nice. Back in the 1950s, turkey Tetrazzini was the height of fashionable cuisine, the stereotypical darling of “ladies who lunch.” Sort of a rich man’s chicken à la king, the dish came to mind the other day as I contemplated the generous pile of excellent roasted turkey meat our Thanksgiving hostess had sent us home with. 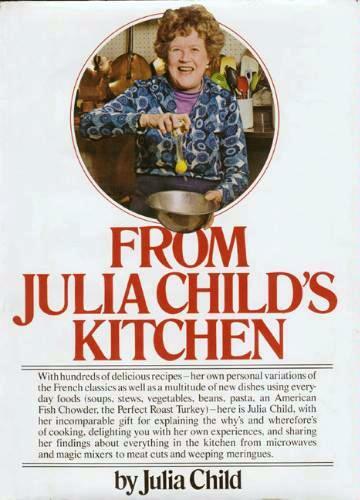 Browsing my cookbooks and the Internet, I quickly learned there are any number of recipes that call themselves turkey Tetrazzini, none apparently with any greater likelihood of being the one that Escoffier is said to have created and named for the renowned opera singer Luisa Tetrazzini – if indeed there’s any truth at all to that legend. 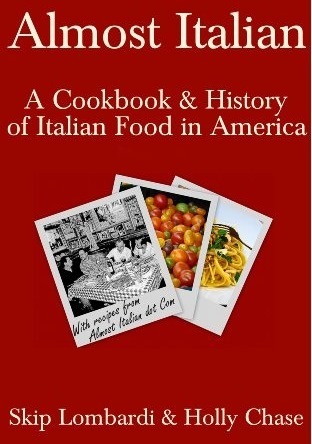 I chose a recipe I found online, from a book called Almost Italian, by Skip Lombardi and Holly Chase. I was going to photograph the preparation process as usual, but I was pressed for time that evening and had a lot of steps to take in rapid succession. Also, I wanted a two-person version and had to cut back quantities given for 6 to 8 servings. Being a barely numerate person, I struggle to calculate things like the number of teaspoons there must be in one-third of a quarter of a cup. So the only image I have to show you is my finished dish. To make it, I started by cooking short rotini pasta until not quite done. Meanwhile, I cut the turkey into small chunks and thinly sliced several white mushrooms. I sauteed the mushrooms in butter. I made a sort of combination bechamel-velouté sauce with flour, butter, milk, chicken bouillon (from a cube), heavy cream, nutmeg, salt, and pepper. I should mention that, given the great variability in the Tetrazzini recipes I’d seen, I felt free to change some of the ingredient quantities given in my source. I used less pasta, more mushrooms, and more peas. In a large bowl I mixed turkey, pasta, mushrooms, sauce, defrosted green peas, and grated parmigiano. Spread it all in a buttered gratin dish, sprinkled on a mix of breadcrumbs and more parmigiano, dotted the top with butter, and baked it in a moderate oven for 40 minutes. It came out looking nicely golden. How did it taste? Well, it was OK. All those pleasant, mild ingredients coexisted peacefully enough, but there was nothing to give the dish any strong character. I don’t fault the recipe: Most of the other versions I saw would have been essentially the same. I suspect that’s just what unadventurous American taste in the ‘50s liked about turkey Tetrazzini: no palatal challenges. Just another piece of evidence that you can’t go home again! Quails are always a treat for me. The very first time I tasted them was in the very first dinner I had in Italy. It was in Rome, 1974, a neighborhood trattoria called La Capricciosa. The weekly menu was a mimeographed broadsheet listing 40 fish, fowl, and meat dishes. Bewildered by the abundance and amazingly low prices, I could hardly believe it when I saw “2 quaglie” – two quails – offered for 1300 lire, which then was about $2. I had to have them! I can’t remember now how they were cooked – possibly just sauteed in butter with sage leaves – but they were beautifully brown, tender, and juicy. I took home the menu, and here it is. If you click on the image, you can read it clearly. The quail entry is down on the lower left. 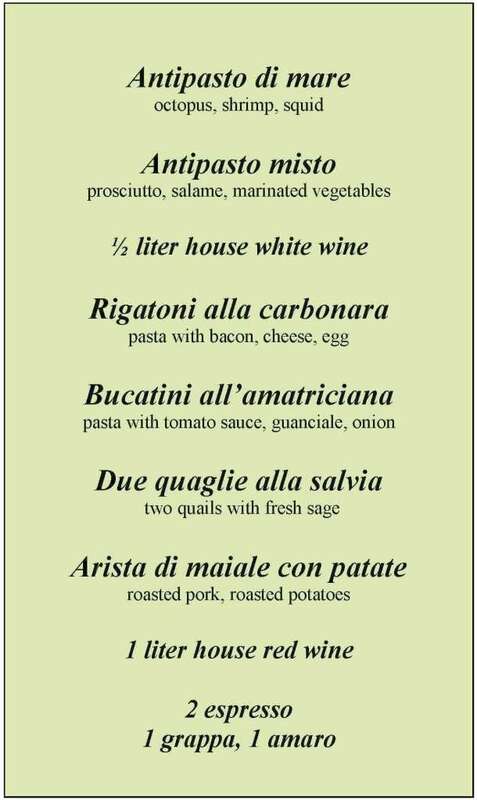 For years after, every time we were in Rome, I had to go at least once to Capricciosa for quaglie. It was a sort of home away from home for us, and we loved everything about it, from its slightly run-down appearance and furnishings to the two musicians – an old violinist and a young guitarist – who made the rounds every evening. Then a fire closed the restaurant for a few years, and when it reopened it was a much fancier kind of place. And no more quails. Sigh. 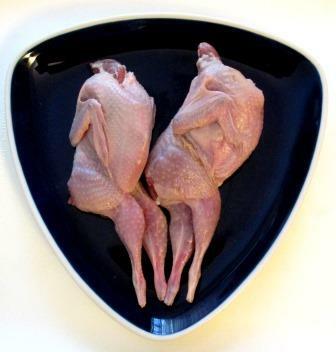 These days, I occasionally treat myself to a pair of quails at home. Mostly when Tom is either away on a trip or out at a business dinner, because he finds the little birds difficult to cope with. A bushy moustache is a liability for hand-held nibbling of meat from tiny bones, which is pretty much the only practical way to eat anything on a quail other than the breast. This latest pair are a little odd looking, having kept the stretched-out position into which they’d been frozen, rather than being plumped up like miniature chickens. I decided to roast them, using a recipe of my own from The Seasons of the Italian Kitchen. 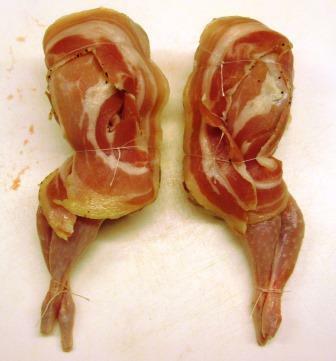 Since the lean little birds need a protective layer of fat to keep them from drying out in the oven, I draped each one with a round of pancetta, which adds flavor as well as moistening. 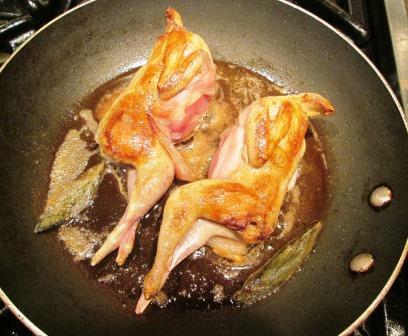 While the oven preheated to 400°, I browned the quails in butter, along with a few sage leaves. 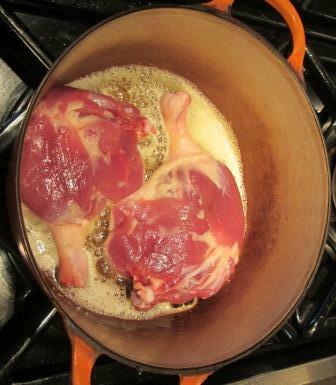 The preliminary sauté is necessary for color, because of the short time the birds would be in the oven. 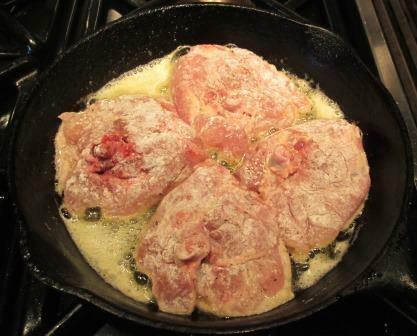 I transferred them to a baking dish, deglazed their sauté pan with white wine, and poured the juices over the quails. In the oven, they roasted for 25 minutes and were ready to eat. 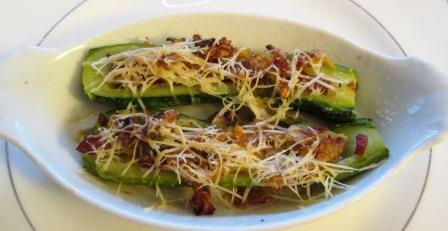 They were wonderfully tasty and, as always, took me back in memory to Capricciosa’s quaglie. I still have my journal notes on that first Roman dinner. 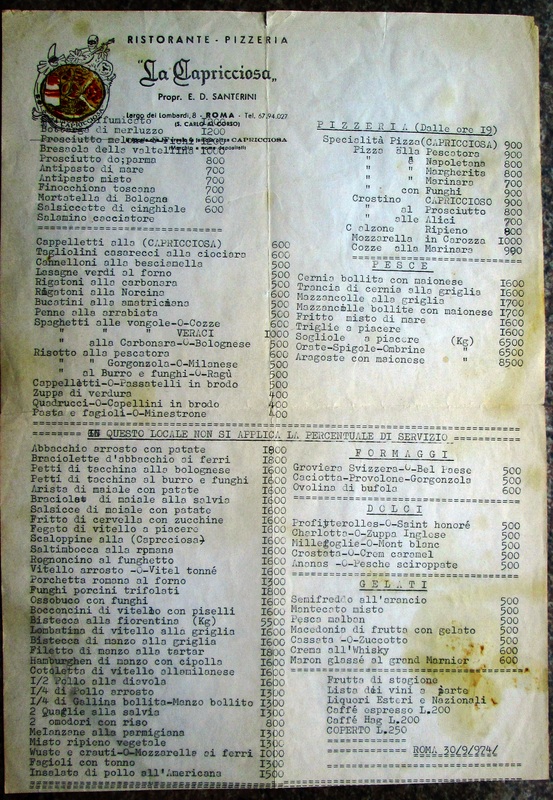 Tom and I had two antipasti, two pastas, two main courses, a liter and a half of wine, two espressos, a grappa, and an amaro – all for 8,500 lire, or about $16. Today, with inflation, my $2 quails would translate to about $10 and the whole meal $65 – but just try to think what this meal would cost today in any restaurant that could serve it! This week I reconstructed an ancient French dish to match with a tasting of two wines made from the Cabernet franc grape: one from France’s Loire valley, the other an American from a winery on Long Island’s North Fork, where traditional Loire grapes do very well. Tom wanted to compare the wines to each other, alone and with dinner. To keep the contest “in the family,” we wanted to have a main course from the Loire region’s cuisine. 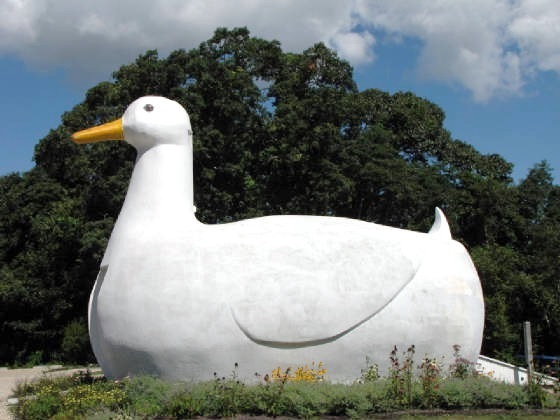 Recipe research revealed that most specialties of the Touraine region are white-wine dishes, in keeping with the many lovely white wines of that area, as well as the culinary resources from its ocean access and many rivers. But we needed a dish to showcase red wine. 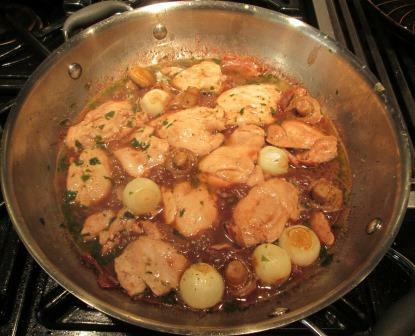 The dish is similar to a typical coq au vin – cut-up chicken braised with mushrooms, onions, and bacon in a red wine sauce – except for the final step, which is to stir chicken blood into the sauce. 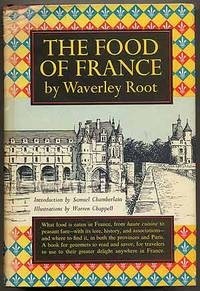 Root hastens to say that, since the blood is mainly a binder for the sauce, the dish can be made just as successfully with conventional thickeners. So, with a little help on ingredient proportions from a recipe for poulet au sang that I found in Larousse Gastronomique, I made the dish for our wine tasting. I wasn’t repulsed by the idea of blood. I’ve often enjoyed blood sausages. I’d also encountered it in the Neapolitan dessert sanguinaccio, which is a chocolate pudding made with pig’s blood. It too can be made with other thickeners, and having tasted it both ways I must say the version with blood was better: it had a lush, velvety mouthfeel. But since fresh chicken blood is not a common grocery item in my neighborhood, I was happy to be allowed to substitute cornstarch. So, on to the cooking. 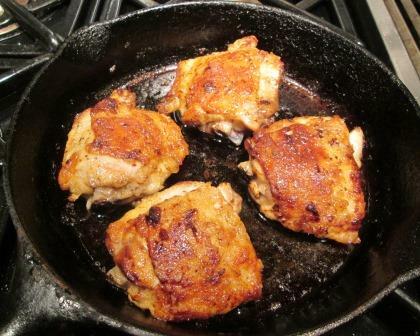 Rather than a whole chicken to be cut up, which is really too much meat for two, I’d taken the lazy path of buying skinless, boneless chicken thighs. I sauteed them in butter until they’d just firmed up, then removed them to a dish. 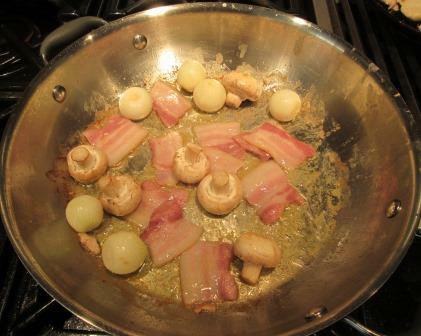 In the same pan, with a little more butter, I sauteed button mushrooms, tiny onions, and pieces of thick-cut bacon until the vegetables were about half done. I transferred them to the dish with the chicken to wait while I started the sauce. I sprinkled flour onto the remaining melted butter, stirred it in for a minute or two, added a lot of red wine and a little broth, and deglazed the pan. Back went the solid ingredients, along with a bay leaf, parsley, thyme, salt, and pepper. 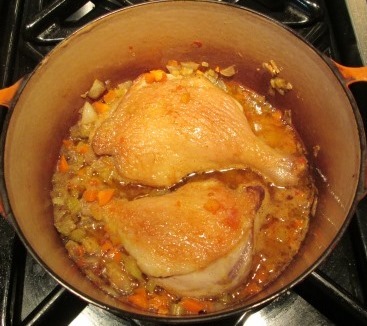 It all simmered together, covered, until the chicken and onions were perfectly tender. At the end I thickened the sauce with cornstarch. I was also supposed to finish it with a flaming dose of brandy. I tried to, but my brandy perversely refused to ignite. Oh, well – I just gave it a stir and cooked a bit longer to burn off the alcohol. 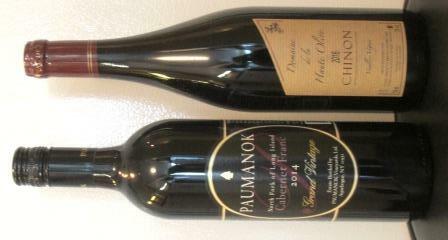 Dinner began with a tasting of the two wines by themselves, both of us taking notes on our impressions. Then we drank the wines with a small first course: baked zucchini boats stuffed with minced soppressata, onion, egg, and parmigiano. Not French, obviously, but tasty, and neither wine made any objection. 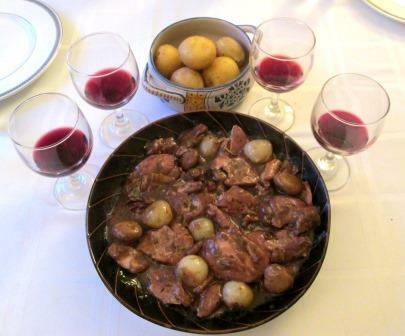 Then came the main event, along with glasses of both wines: the bloodless wine-braised chicken, with small potatoes boiled in their jackets. 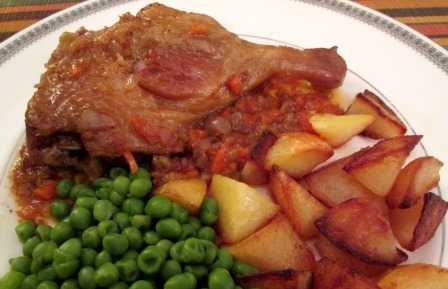 It was a good coq au vin – and less fuss to prepare than some I’ve made from other recipes. I slightly regret not having been able to try it properly with chicken blood, but we enjoyed it enough just as it was that I expect I’ll be making it that way again. The dish also served very well as a testing ground for the two Cabernet franc wines. If you’d like to know how that worked out, you can read about it on Tom’s blog, here. Last week Tom and I made our annual spring birding pilgrimage to Cape May, New Jersey, a hotspot for migratory birds. We stay in an oceanfront motel apartment with a kitchen, so we can alternate dining out and dining in. Not to waste birding time with extensive food preparation, we bring along pre-cooked main dishes in a cooler chest. This year our friend Jennifer was with us, so we were cooking for three. The appetizers for our first dinner in the apartment were a specialty of Tom’s, elegantly known as “cheese thingies.” For these he lightly pan-cooks 7” frozen parathas, tops them with cheeses and other items as inspiration suggests, and runs them under the broiler until the cheese melts. We brought all the ingredients for these in the cooler chest. On the left, a thingy with Isle of Mull, a Scottish cheddar, and Greek-style pickled peppers. In the center, one with Puigpedrós, a Catalonian cow cheese, and Italian corallina salame. On the right, Puigpedrós again with chopped onion and pickled jalapeño peppers. Very eclectic and international, eh? Our main course was a stew of chunks of skinless, boneless chicken thighs with potatoes, carrots, mushrooms, green beans, onions, garlic, a few dashes of Cholula hot sauce, white wine, and chicken stock, thickened with flour. I’d made and frozen it several days in advance. It was plain, homey, and tasty. The next night we went out for dinner to the Lobster House, a popular dockside restaurant. There we always start with Cape May Salts, an especially succulent local oyster. The three of us happily went through two dozen oysters and then went on to excellent fried soft-shell crabs and fried sea scallops. The menu always offers elaborate creamed seafood concoctions, but we prefer to keep things simple and enjoy the freshness of the prime fish and shellfish. 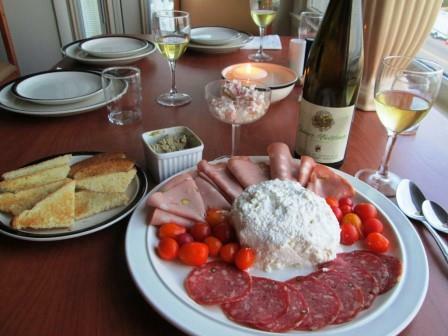 At home again the following day, we sat to a mixed antipasto, the components of which also came along with us in the cooler chest: fresh ricotta, mortadella, sweet sopressata, grape tomatoes, a smoked shrimp and crab spread, Venetian-style calf’s liver pâté, and toast triangles. The main event was a pan of lasagna that I’d made in advance, baked, and frozen for transport. It was partly a Marcella Hazan-style northern Italian version, with Bolognese meat sauce and béchamel, but with Neapolitan additions of mozzarella and coins of sweet sausage – all between many layers of our thinnest homemade lasagna noodles. Reheating the lasagna in a very hot oven provided nice crunchy end pieces to contrast with the meltingly lush central section. .The final dinner of our trip was again at the Lobster House, and again we started with two dozen of our favorite Cape May Salts. We went on to the restaurant’s signature snapper soup (not pictured below), fried flounder and fried calamari. Everything was sparklingly fresh and perfectly cooked. Lest you think all we did in Cape May was eat, be assured the birding was fine, even though the weather was a bit dodgy. We got up very early each day and did quite a bit of walking, which was how we worked up appetites for all that food. We logged a total of 93 species of birds over 3½ days.